The Legendary Republic Artists Boat Party is back for our final Thames-rocking party of 2013. As usual there will be a kicking after-party as well, this time at Fire Nightclub for massive Random Magic Halloween Party showcasing four labels in three rooms with a stellar line up including Omar S, Maxxi Soundsystem, Horse Meat Disco, Luke Solomon, Honey Dijon Live plus JG Wilkkes & JD Twitch as Optimo. The entire space will be transformed into a Halloween horror show complete with its own Ghost Train in the courtyard. Halloween in London has a new home, and there’s room for everyone. Wearing Halloween costume to the boat party is encouraged, accepted and allowed, but by no means compulsory. 5:30PM – 6:30PM Pre-Drink at Bar&Co. 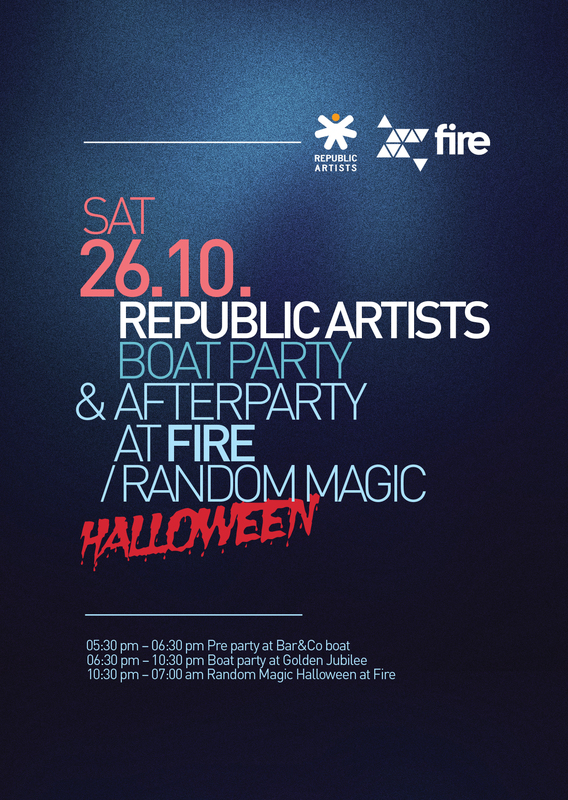 Your ticket will be exchanged for a wristband that is valid for entry to the boat party and re-entry to Fire Halloween Party. 6:30PM –10:30PM Boat party | boat departs at 6:30PM! Please note, all wristband holders gain free entry to Fire before midnight!